A couple of months ago I started to read the Outlander series by Diana Gabaldon. I fell in love with the story immediately. Even before I finished the book, I started watching the tv series and fell in love all over again, this time with the costumes. Claire’s costumes are amazing. And that knitwear, to die for. As I am want to do when I find new knitwear I love, I jump on Ravelry and look for patterns inspired by series. 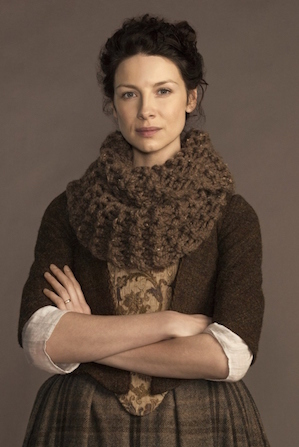 One of the items I definitely wanted to knit was that delightful cowl Claire seems to wear often. I immediately found the pattern by Shelli Westcott for Ravelry Outlander Claire’s Cowl Pattern. When searching for suitable yarn, I found that Westcott owns a store named Knitterly in Petaluma, CA and they sold a Knitterly Claire’s Outlander Cowl Kit for the cowl. Happy days! I quickly snapped up the dark brown + grey kit; once it arrived, I grabbed by size 35 needles and set to work. The pattern and kit call for 3 skeins of yarn, but I found I only used 2 to make the 30 inch cowl. (Oh what to do with that full last skein?) The knitting only took two days (it would have taken one but I started in the evening) and was real quick since it’s all garter stitch and large needles. As usual, the needle size took a toll not only on my hands but my shoulders as well; it takes a lot of strength and effort to hold yarn onto size 35 needles. Blocking flat took some time as well since a) I have a mischievous cat that wouldn’t leave my cowl alone unless I closed the bedroom doors and b) the yarn is held double so it’s thick and takes longer to dry. Next I think I’ll try my hand at one of her many fingerless gloves or one of the knitted shawls she wears. So many choices! This entry was posted in Cosplay, Knitting, Outlander, Sewing and Crafts and tagged accessories, claire fraser, claire randall, cowl, knit, knitting, knitwear, outlander. Bookmark the permalink.